80x200cm Motorized wall hanging banner with rolling high res color graphics printed on durable flag cloth. A Great eye-catching display. 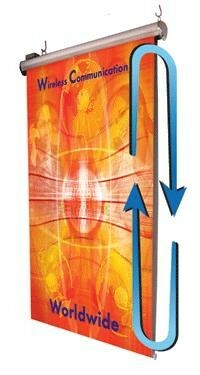 Create constant attention with a wall hanging motorized banner display. Great for retail stores and promotional events, our motorized banner constantly rotates between two different custom printed graphic designs (artwork provided by the customer) that is included in our price for the item. Easily set up the banner by hanging the display rack onto any wall. The display includes a carry bag that can also hold the included motor that can be turned on and off to control the rotation of the graphics. The graphics are high resolution printed graphics onto flexible flag cloth material.